While in Istanbul, there is no better place to escape the hot Turkey summer than to explore the Yerebatan Sarayi (Sunken Palace) Basilica Cistern (Entrance Fee: 10 TL). This huge underground cistern used to serve as a place where the city’s water is drawn from and where water from nearby mountains pool. Nowadays, it has become a popular tourist attraction and even a concert venue due to its cooling and acoustically pleasant environment. 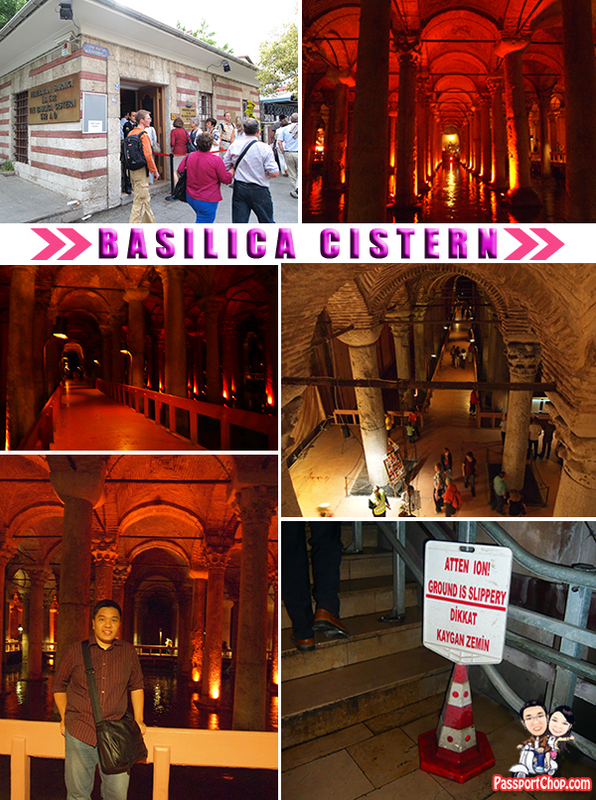 Some parts of the cistern is quite dim and wet so watch your step on the slippery floor. The entire photo-taking process took less than 5 minutes – choose your costumes from a rack of heavy strange hats and gowns (no need to change clothes – just put the costumes over yourself) and wait for the existing group of “Sultans” to be done with their royal photos. Once your turn is reached – sit down and listen to instructions, snap snap snap and you are done! 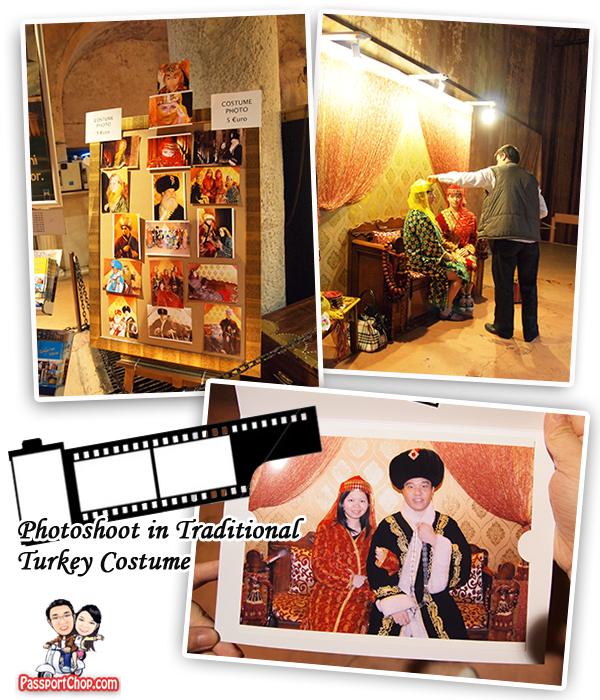 Return the costumes and pick-up your photo which is printed on the spot within seconds. The “Mona Lisa” equivalent in the Yerebatan Sarayi Basilica Cistern has got to be the Medusa head pillars located at the far end of the cistern – just follow the crowds! 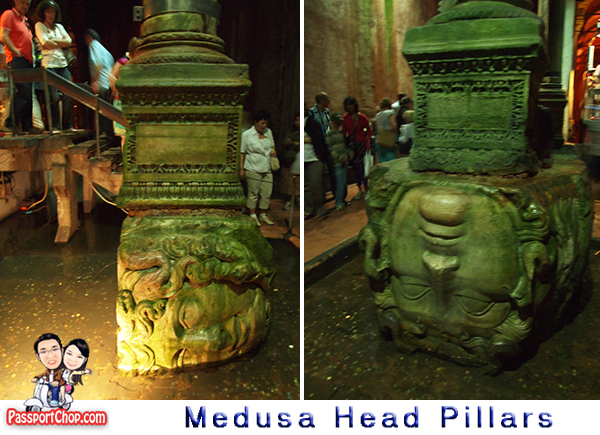 There are 2 Medusa heads aligned sideway and inverted, holding up two pillars – it was said that they were removed during ancient times from buildings above the cistern and placed here in an inverted manner to curb the power of these Medusa head stone structure. Medusa head carvings were used a long time ago in the design of architecture around this area as a form of protection amulet, blessing the buildings it was based in. We have heard the story of Medusa’s gaze which could turn humans into stone – perhaps that’s where the myth came from. 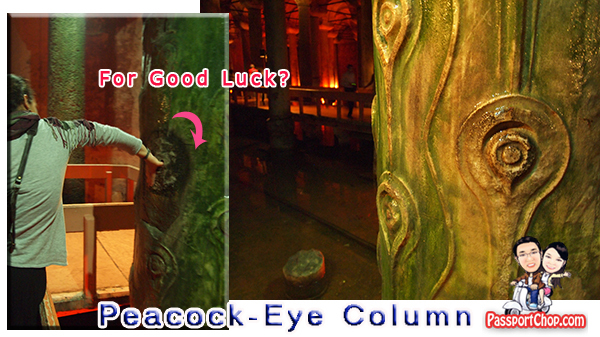 Another very popular structure in the Basilica Cistern is the Peacock Column which is quite a nice pillar with peacock feather designs – there is a hole in the pillar where supposedly if you insert your finger in it and turn 360 degrees on your palm, you will get good luck. This is again a lovely set of images and nice story, I would love to read some more text. You couldnt pay me to irgnoe these posts! I love seeing your pictures! We just recently returned from a trip to Istanbul and I’m planning on blogging about our trip soon – feel free to check it out!